September 5, 2012 — When Gene Chizik was hired at Auburn he carried with him a number that hung like a concrete albatross around his neck. 5-19. Chizik’s record as head coach of the Iowa State Cyclones. The dubious numerical distinction was repeated relentlessly. It became almost a part of his name. He wasn’t Coach Gene Chizik; he was 5-19 Coach Gene Chizik. Three seasons an SEC and a national championship later, 5-19 has all but faded from memory. It’s a footnote to his coaching career, not the definition of the same. That equation was promoted by web hacker Clay Travis. It was hurled like an accusation by callers to the Finebaum radio show (albeit mostly by rival fans). And late yesterday afternoon a national sports call-in show opened with an Alabama fan who wanted to discuss, yes, 16-10. The contention is that there is an undercurrent of discontent among the Auburn family, that we as a whole are uneasy about Chizik because “if you take away Cam Newton…” well, you know the drill. That logic is flawed and flawed not only because those drawing the conclusions are outside the Auburn family. The standards they use to judge us are not ours and do not fit. Do you measure Urban Meyer by differentiating between his Tebow and non-Tebow years? Meyer was just 18-8 without Tim, by the way. Take away Bear Bryant and Alabama is a mediocre football program. Take away Bryan Cranston and Breaking Bad doesn’t win Emmys. Take away cheese and you just have macaroni. You can’t pretend that Cam Newton didn’t happen. By the same token you have to give credit where credit is due. Many coaches have spectacular talent and can’t put the pieces together to win it all. Peyton Manning says so, as does Bo Jackson. Chizik deserves credit for the job he did in 2010. You can’t take it away. When Chizik arrived in Auburn he found a program that was demoralized after a rancorous coaching change and a team that was depleted of talent. Most observers predicted his Tigers would lose the opener to a mid-level opponent and be fortunate to make a bowl. Auburn won the opener, was competitive in nearly every game and earned a bid to a New Year’s Day bowl game. Under Chizik, the team defied expectations. In 2010 the addition of Newton was expected to bring variety to the offense and give the Tigers a chance to improve to possibly eight or nine wins. We all know what happened in 2010. The job Chizik and his staff did of guiding the program through a minefield of distraction to the ultimate goal was nothing short of masterful. So many stars were lost prior to 2011 that a down year was forecast. State and national media had Auburn winning as few as four games. Chizik’s Tigers won eight. For three consecutive years Chizik performed better than anyone outside the program expected. Beyond that, Chizik and his staff have recruited better than anyone could have imagined. Even as the program across the state built what many in the media have fawningly called a recruiting machine, Chizik did not back down. He’s recruited as well as any Auburn coach in history and is in the process of stockpiling a wealth of talent to rival any program in the nation. Chizik is calm, cool confident and measured. He doesn’t rant and rave, throw temper tantrums at media events, isn’t prone to berating players on the sidelines and has yet to trash his headset. His demeanor is a perfect fit for Auburn. He was the right person to handle the first year pressures, the right man to steer Auburn through the much-ado-about-nothing controversy of 2010 and the definitely the right man when tragedy struck the Auburn campus this offseason. Are there areas of concern? Sure. Over the last three seasons the Auburn defense set records for futility. No Auburn defense has been statistically worse than the three fielded under Chizik. And still the team won the 2010 national title. Chizik addressed the defensive deficiencies by parting ways with coordinator Ted Roof and bringing in highly respected Brian Van Gorder to direct the Tiger stopping unit. When offensive coordinator Gus Malzahn took a head coaching job, Chizik had an opportunity to address the most glaring offensive weakness, quarterback, and he did so. New offensive coordinator Scott Loeffler has a reputation for grooming some of the best at the position. He’s made the right moves. The upgrade in talent is not without its own drawbacks. 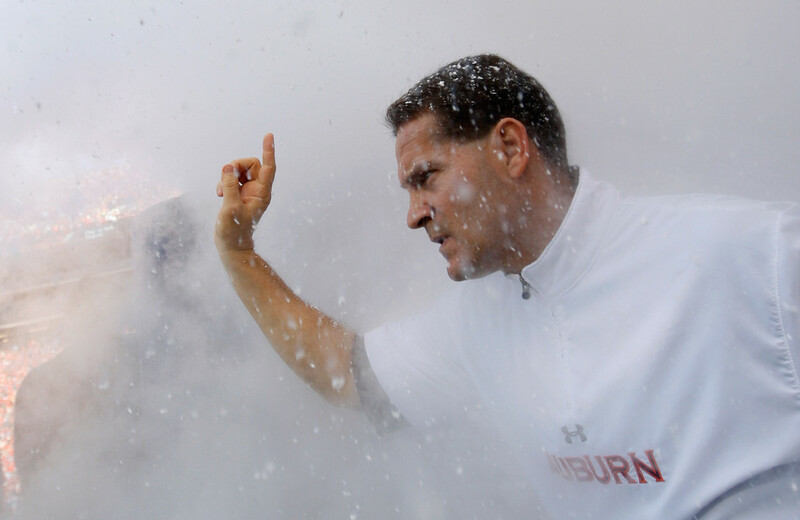 Chizik handles team discipline with a swift, fair and steady hand. Players are expected to conform to team expectations. Transgressions aren’t handled with ice cream suppers and half-game “are we behind” suspensions. Chizik understands that while he was hired to win football games, his first priority is to help his players become men who represent themselves and their families well. Chizik is also aware that his record against Auburn’s three primary opponents (as it typically pertains to the SEC West race) Arkansas, LSU and Alabama stands at 3-6 overall. He didn’t fall off the turnip wagon yesterday and knows those scales have to tip. Don’t let the cadre of dogs barking on the airwaves, the legion of blogger hacks lurking on the Internet or the agenda-driven wail of the press influence you or sway your thinking. Gene Chizik on the hotseat? Don’t be ridiculous. We aren’t a nation of knee-jerk reactionaries. That’s not what we are about. That’s not who we are. It’s not who we should become. No matter what happens against Mississippi State on Saturday. Three straight years of overachieving and doing what nobody thought he could do has earned Chizik the right to have a year where he figures things out. Frankly, milking eight wins out of the 2011 team given the double decline at quarterback and on defense was a miracle and maybe his best coaching job. Make no mistake, we want Auburn to be successful on the field, but athletic achievement is not the alpha and omega. We don’t carry with us a sense of entitlement so strong that every season that ends without a championship is a failure. We hope we have the perspective to understand that this marvelous game that we love is at the end of the day just that — a game. We are not defined by Saturday wins and losses. Our entire self-worth isn’t determined by the vagaries of a game over which we have no control. Our sense of being isn’t measured by the number of flags, stickers and banners we can apply to our car. We are Auburn, we do what we do and we’re just fine with that. We’re also just fine with Gene Chizik, or we should be. He’s spent three years doing his job better than anyone had a legitimate right to hope. He’s done so against tremendous odds. And he’s done it the right way. As Auburn fans and family, what else should we expect? Over the last 31 years Auburn is tenth in total wins nationally and ninth in winning percentage. You’d never know it from what you read, see and hear in the state media, but those are the facts. The only SEC team ranked higher in either wins or percentage over that span is Florida. Think about that for a second. Repeat it to yourself. The second most successful football program in the SEC over the last 31 years is Auburn. That is who we are. Consistent success. Don’t let the rest of the meaningless numbers paraded by those who wish to demean us affect you. We have no desire nor need to be defined by your standards of success, whoever you may be. We are who we are, not who you think we should be. This is a magnificent statement of who the Auburn Family truly is and why we really are different from so many other schools’ fan bases. This is not a “we’re better than everyone else” rant. We are different than almost everyone else and for those who don’t get it, that’s OK. Personally, I wouldn’t trade Coach Chizik for any other coach in the country. Yes, we will win on the field but we will do it in a way that brings honor to Auburn University, it’s students, alumni, fans; and to the entire Auburn Family. You are on target with this piece. You cannot let others define who you are or what you think you should be. There is a concerted effort to discredit Auburn and anyone associated with it to have a negative impact on recruiting. You would think the school we share a state with would be happy with their success but that is not enough. They have to create unrest among Auburn people to try to further their cause. These first two games were always going to be about survive and advance because the bulk of the starters have ten or fewer starts at their current position and even the more seasoned players gained that experience under completely different systems. Even the leaders are trying to find their way. This team will improve over the course of the season and the PROGRAM is headed in the right direction. I enjoy reading all of the NTY posts. And of course I agree that one cannot remove 2010 wins from the equation. Wins and losses do not define who we are, but they are important. And in this day and time they matter a lot. It does matter what happened at Starkville today. It would be irresponsible to think otherwise. I am curious if the author of this article still feels the same way.